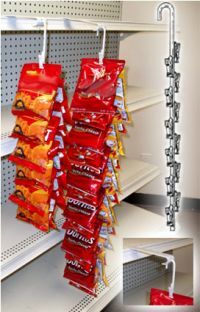 Double sided metal clip strips provide 2x the product merchandising capability with its two sided hook action making for a very powerful point of purchase wand retailer display. 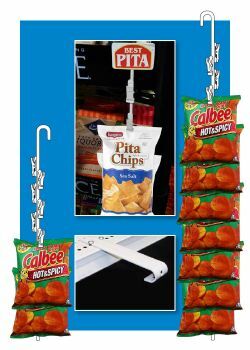 These display strips work very well when suspended off a shelf edge or other point of purchase display. We manufacture only the best quality you will find, all while maintaining affordable costs, it's a winning combination which extends your POP store fixture budget to other needs you may have. Ask for free samples to test them out, we are confident that once you use our products, you will be a customer for life. Do you need single sided metal clip strips or another kind of strip? Check out Clip Strip Corp.'s extensive line up of strip hook merchandisders today, ranging from the original molded plastic design, to the Posi-Lok evolved molded plastic series, our die cut flat plastic Econo-Line series, to these metal clip strips and our newest invention in strips, the adhesive based mounting line called Sticky Strips! Minimum quantity for "Double Sided Metal Clip Strip® Brand Merchandising Strip, 12 Hooks, 18" Long, MSDB-32" is 20. 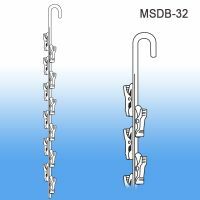 Minimum quantity for "Double Sided Metal Clip Strip® Brand Merchandising Strip, 24 Hooks, 32-1/4" Long, MSDB-58" is 20. 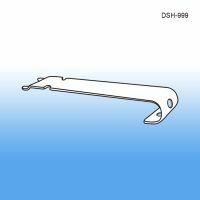 Minimum quantity for "Double Metal Clip Strip® Hanger - Metal, Heavy Duty, DSH-999" is 20.